United Nations Resolution 181, resolution passed by the United Nations (UN) General Assembly in 1947 that called for the partition of Palestine into Arab and Jewish states, with the city of Jerusalem as a corpus separatum (Latin: “separate entity”) to be governed by a special international regime. The resolution—which was considered by the Jewish community in Palestine to be a legal basis for the establishment of Israel, and which was rejected by the Arab community—was succeeded almost immediately by violence. 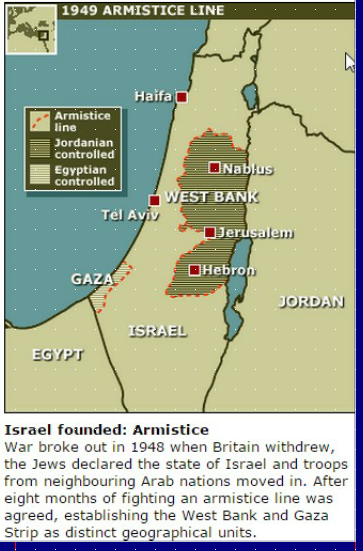 Palestine had been governed by Great Britain since 1922. Since that time, Jewish immigration to the region had increased, and tensions between Arabs and Jews had grown. In April 1947, exhausted by World War II and increasingly intent upon withdrawing from the Middle East region, Britain referred the issue of Palestine to the UN. To investigate a suitable course of action, the UN formed the UN Special Committee on Palestine (UNSCOP), an inquiry committee made up of members from 11 countries. Ultimately, UNSCOP delivered two proposals: that of the majority, which recommended two separate states joined economically, and that of the minority, which supported the formation of a single binational state made up of autonomous Jewish and Palestinian areas. The Jewish community approved of the first of these proposals, while the Arabs opposed them both and instead suggested a single secular democratic state in Palestine with citizens receiving equal rights. A counterproposal—including a provision that only those Jews who had arrived before the Balfour Declaration (and their descendents) would be citizens of the state—did not win Jewish favour. The proposal to partition Palestine, based on a modified version of the UNSCOP majority report, was put to a General Assembly vote on Nov. 29, 1947. The fate of the proposal was initially uncertain, but after a period of intense lobbying by pro-Jewish groups and individuals, the resolution was passed with 33 votes in favour, 13 against, and 10 abstentions. In 1947 the British put the future of western Palestine into the hands of the United Nations, the successor organization to the League of Nations which had established the “Mandate for Palestine.” A UN Commission recommended partitioning what was left of the original Mandate – western Palestine – into two new states, one Jewish and one Arab. Jerusalem and its surrounding villages were to be temporarily classified as an international zone belonging to neither polity. What resulted was Resolution 181 [known also as the 1947 Partition Plan], a nonbinding recommendation to partition Palestine, whose implementation hinged on acceptance by both parties – Arabs and Jews. The resolution was adopted on November 29, 1947 in the General Assembly by a vote of 33-12, with 10 abstentions. Among the supporters were the United States and the Soviet Union, as well as other nations including France and Australia. The Arab nations, including Egypt, Syria, Iraq, and Saudi Arabia denounced the plan on the General Assembly floor and voted as a bloc against Resolution 181 promising to defy its implementation by force. The resolution recognized the need for immediate Jewish statehood [and a parallel Arab state], but the blueprint for peace became a moot issue when the Arabs refused to accept it. Subsequently, realities on the ground in the wake of Arab aggression [and Israel’s survival] became the basis for UN efforts to bring peace. “Having constituted a Special Committee and instructed it to investigate all questions and issues relevant to the problem of Palestine, and to prepare proposals for the solution of the problem, and having received and examined the report of the Special Committee (document A/364). … Recommends to the United Kingdom, as the mandatory Power for Palestine, and to all other Members of the United Nations the adoption and implementation, with regard to the future Government of Palestine, of the Plan of Partition with Economic Union set out below;” [Italics bauthor]. Resolution 181 was the last of a series of recommendations that had been drawn up over the years by the Mandatory and by international commissions, plans designed to reach an historic compromise between Arabs and Jews in western Palestine. 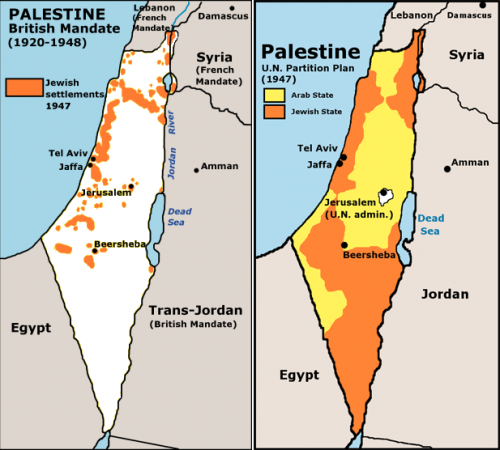 The first was in 1922 when Great Britain unilaterally partitioned Palestine, which did not satisfy the Arabs who wanted the entire country to be Arab. two 1946 proposals that championed a binational state; one proposed by the Anglo-American Committee of Inquiry in April 1946 based on a single state with equal powers for Jews and Arabs; and the MorrisonGrady Plan raised in July 1946 which recommended a federal state with two provinces – one Jewish, one Arab. Every scheme since 1922 was rejected by the Arab side, including decidedly pro-Arab ones merely because these plans recognized Jews as a nation and gave Jewish citizens of Mandate Palestine political representation. Arabs rejected the “unbalanced” Partition Plan. The UN International Court of Justice (ICJ) uses the term “unbalanced” in describing the reason for Arab rejectionism of Resolution 181, which does not exactly fit reality. “17,000,000 Arabs now occupied an area of 1,290,000 square miles, including all the principal Arab and Moslem centers, while Palestine, after the loss of Transjordan, was only 10,000 square miles; yet the majority plan proposed to reduce it by one half. UNSCOP proposed to eliminate Western Galilee from the Jewish State; that was an injustice and a grievous handicap to the development of the Jewish State.” [Italics by author]. Arabs not only rejected the compromise and took action to prevent establishment of a Jewish state but also blocked establishment of an Arab state under the partition plan not just before the Israel War of Independence, but also after the war when they themselves controlled the West Bank (1948-1967). The UN itself recognized that Resolution 181 had not been accepted by the Arab side, rendering it a dead issue: On January 29, 1948, the First Monthly Progress Report of the UN-appointed Palestine Commission charged with helping put Resolution 181 into effect was submitted to the Security Council (A/AC.21/7). Implementation of Resolution 181 hinged not only on the five member states appointed to represent the UN [Bolivia, Czechoslovakia, Denmark, Panama, Philippines and Great Britain], but first and foremost on the participation of the two sides who were invited to appoint representatives. Some thought the Partition Plan could be revived, but by the end of the war, Resolution 181 had become a moot issue as realities on the ground made the establishment of an armistice-line [the “Green Line”] – a temporary ceasefire line expected to be followed by peace treaties – the most constructive path to solving the conflict. 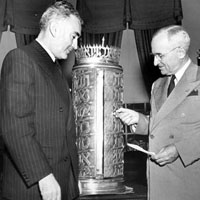 By the time armistice agreements were reached in 1949 between Israel and its immediate Arab neighbors (Egypt, Lebanon, Syria and Trans-Jordan) with the assistance of UN Mediator Dr. Ralph Bunche, Resolution 181 had become irrelevant, and the armistice agreements addressed new realities created by the war. Over subsequent years, the UN simply abandoned the recommendations of Resolution 181, as its ideas were drained of all relevance by subsequent events. Moreover, the Arabs continued to reject 181 after the war when they themselves controlled the West Bank (1948-1967) which Jordan invaded in the course of the war and annexed illegally. Attempts by Palestinians to roll back the clock and resuscitate Resolution 181 more than six decades after they rejected it as if nothing had happened are a baseless ploy designed to use Resolution 181 as leverage to bring about a greater Israeli withdrawal from parts of western Palestine and to gain a broader base from which to continue to attack an Israel with even less defendable borders. “To attempt to show … that Resolution 181 ‘remains’ in force in 1981 is thus an undertaking even more miraculous than would be the revival of the dead. It is an attempt to give life to an entity that the Arab states had themselves aborted before it came to maturity and birth. To propose that Resolution 181 can be treated as if it has binding force in 1981, for the benefit of the same Arab states, who by their aggression destroyed it ab initio, [In Latin: From the beginning] also violates “general principles of law,” such as those requiring claimants to equity to come “with clean hands,” and forbidding a party who has unlawfully repudiated a transaction from holding the other party to terms that suit the later expediencies of the repudiating party.” [Italics by author]. Resolution 181 had been tossed into the waste bin of history, along with the Partition Plans that preceded it. Israel’s independence is not a result of a partial implementation of the Partition Plan. Resolution 181 has no legal ramifications – that is, it recognized the Jewish right to statehood, but its validity as a potentially legal and binding document was never consummated. Like the proposals that preceded it, Resolution 181’s validity hinged on acceptance by both parties of the General Assembly’s recommendation. “The State of Israel is thus not legally derived from the partition plan, but rests (as do most other states in the world) on assertion of independence by its people and government, on the vindication of that independence by arms against assault by other states, and on the establishment of orderly government within territory under its stable control. The result was as follows following intense lobbying by the Jewish and Arab sides. FOR THE RESOLUTION (33) - Australia, Belgium, Bolivia, Brazil, Canada, Costa Rica, Czechoslovakia, Denmark, Dominican Republic, Ecuador, France, Guatemala, Haiti, Iceland, Liberia, Luxembourg, the Netherlands, New Zealand, Nicaragua, Norway, Panama, Paraguay, Peru Philippines, Poland, Sweden, Ukraine, South Africa, Uruguay, the Soviet Union, the United States, Venezuela, White Russia. (The Torah is Judaism’s most important text. It is composed of the Five Books of Moses, the 613 commandments (mitzvot) and the Ten Commandments. The 1948 Arab–Israeli War or the First Arab–Israeli War was fought between the State of Israel and a military coalition of Arab states. In Hebrew it is known as The War of Independence (Hebrew: מלחמת העצמאות‎, Milkhemet Ha'Atzma'ut) or the War of Liberation (Hebrew: מלחמת השחרור‎, Milkhemet HaShikhrur). This war formed the second stage of the 1948 Palestine war, known in Arabic as The Nakba or Catastrophe (Arabic: النكبة‎, al-Nakba). On 15 May 1948 the ongoing civil war transformed into an inter-state conflict between Israel and the Arab states, following the Israeli Declaration of Independence the previous day. A combined invasion by Egypt, Jordan and Syria, together with expeditionary forces from Iraq, entered Palestine - Jordan having declared privately to Yishuv emissaries on 2 May it would abide by a decision not to attack the Jewish state. The invading forces took control of the Arab areas and immediately attacked Israeli forces and several Jewish settlements. The 10 months of fighting, interrupted by several truce periods, took place mostly on the former territory of the British Mandate and for a short time also in the Sinai Peninsula and southern Lebanon. As a result of the war the State of Israel retained the area that the UN General Assembly Resolution 181 had recommended for the proposed Jewish state as well as almost 60% of the area of Arab state proposed by the 1948 Partition Plan, including the Jaffa, Lydda and Ramle area, Galilee, some parts of the Negev, a wide strip along the Tel-Aviv-Jerusalem road, West Jerusalem, and some territories in the West Bank. Transjordan took control of the remainder of the former British mandate, which it annexed, and the Egyptian military took control of the Gaza Strip. At the Jericho Conference on 1 December 1948, 2,000 Palestinian delegates called for unification of Palestine & Transjordan as a step toward full Arab unity." No state was created for the Palestinian Arabs. The conflict triggered significant demographic change throughout the Middle East. Around 700,000 Palestinian Arabs fled or were expelled from the area that became Israel and they became Palestinian refugees. In the three years following the war, about 700,000 Jews immigrated to Israel with many of them having been expelled from their previous countries of residence in the Middle East. Shlomo Hillel immigrated to Mandatory Palestine following the Balfour Declaration and became a prominent politician and diplomat.